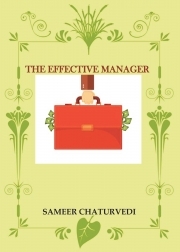 Description of "THE EFFECTIVE MANAGER"
A concise and practical book about how to be an effective manager.The unique insights give you a fair idea of Contribution, Commitment & Fulfillment of objectives. The author is a seasoned marketing professional, an entrepreneur. With an experience of over two decades of working with organisations of repute in India and overseas, he offers a wealth of practical knowledge and insights to address the challenges that managers face. Reviews of "THE EFFECTIVE MANAGER"
An excellent and attractive book full of useful insights and practical knowledge, whether for senior management, working professionals or an aspiring student. The book provides many a interesting ideas and examples which can be put to practical and profitable use. It is delightfully informative and crystal clear in approach.